North Myrtle Beach and Myrtle Beach are twin cities, but there are some big differences in the neighborhoods and types of accommodations in the two. Myrtle Beach is older. Traditionally it was hotel after hotel, side by side, and the residential parts were on the outskirts - mostly to the far north, 31st Ave North and on up to the city limits. You don't find many beach houses in Myrtle Beach in the main tourist sections. The older, wooden beach houses in North Myrtle Beach are often used for spring breakers, monthly rentals, winter rentals, and even owner residences. Oceanfront homes for sale in Myrtle Beach or North Myrtle Beach will be expensive no matter what, but the older and smaller ones may not be out of reach. 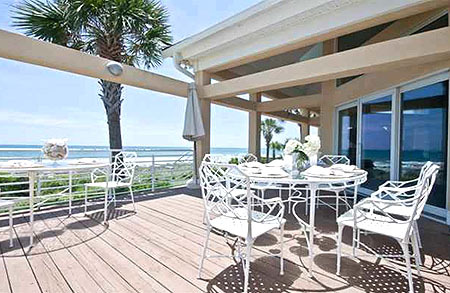 The newer, bigger luxury beach homes are usually investment properties, and are managed by property rental companies. They are rarely under several million dollars, and can bring in a rental income in the thousands per week. Move across the street from the ocean and pick an older, smaller beach house, and you may be able to purchase your perfect vacation home for prices in the mid 300's, especially in today's real estate economy. 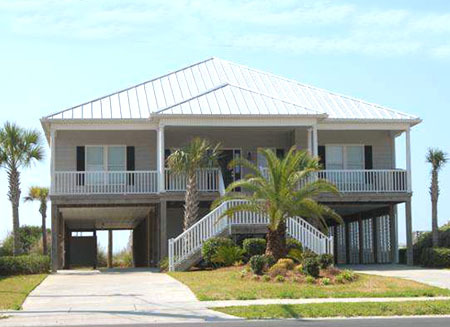 Why would you choose a Myrtle Beach beach house over a condo? PRIVACY, for one thing, especially if you intend to use it for your own vacation time. Homes here often have a private pool and jacuzzi. You can turn your music up loud, and let the kids loose. You can swim all night and sleep all day without being disturbed. The bedrooms are usually oceanfront and have private balconies, You can wake to the glorious views and sounds of the ocean. If you are renting it out, you can allow motorcycles, pets, or college kids - it's your decision, not an HOA rule. If you are wanting to buy a North Myrtle Beach home away from the beach (and much more affordable) there are many, many golf course homes in North Myrtle Beach. If you're a boater, then a home on the Intracoastal Waterway may be heaven, and often has a private dock. 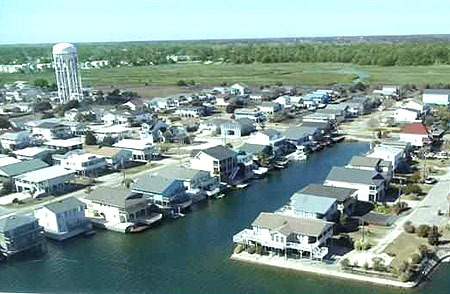 Cherry Grove has streets and streets of "Channnel Homes" that have gorgeous views of the winding inlet and access the Waterway. A home here offers the beach AND the boat access! Any way you look at it, North Myrtle Beach vacation homes are a very good option for anyone looking to buy investment real estate in the Grand Strand area. With prices at their very lowest right now, there will never be a better time to consider a beach house in North Myrtle Beach. Our experienced agents will comb through the mines and show you the diamonds. Trust the professionals at Barefoot Realty with all your North Myrtle Beach real estate needs.